FAQ: How do you determine the version of an enterprise (ArcSDE) geodatabase in Catalog? Right-click the database connection in the Catalog tree and click Properties > General Tab. The Upgrade Status indicates the geodatabase version you are using. 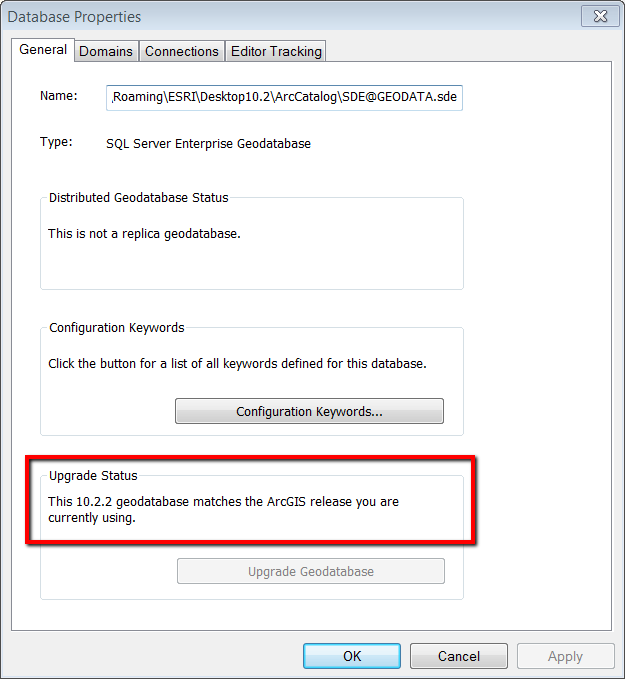 If the Upgrade Status indicates that the geodatabase matches the ArcGIS release you are using, your geodatabase is compatible with your ArcGIS release, and you do not need to upgrade the geodatabase. If system tables or stored procedures need to be upgraded, the text will state that your geodatabase can be upgraded and the Upgrade Geodatabase button will be active.